Steinberg, Steve & Lyle Spatz. 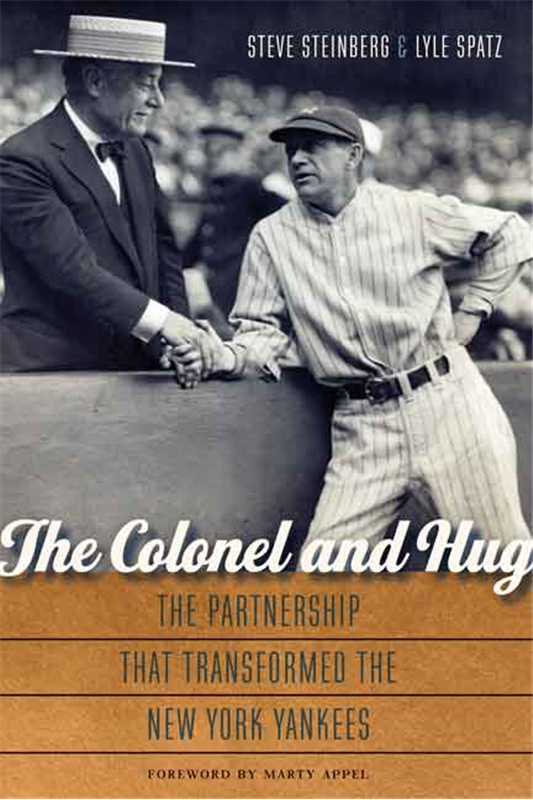 The Colonel and Hug: The Partnership That Transformed the New York Yankees. Lincoln: University of Nebraska Press, 2015. Pp. 344. Notes and Index. $34.95 hardcover. In his chapter in the seminal book New American Sport History, Stephen Hardy calls for the additional need for studies focused on the role of owners in sports.Over the years, studies have emerged covering a few important figures and their contributions to the development of professional sports. The Colonel and Hug offers a strong dual biography that provides an excellent telling of the important contributions of owner Jacob Ruppert and manager Miller Huggins to the New York Yankees dynasty. Ruppert eventually became the team’s sole owner and he hired knowledgeable baseball men for the key positions of field manager and general manager. Ruppert’s other major contribution was investing the money to build the colossal Yankee Stadium.The Stadium became the flagship location for baseball and a monument to sports that hosted some of the most significant events in sports history. While Steinberg and Spatz provide insight into the building of the stadium, Neil Sullivan’s The Diamond in the Bronx remains the best on that topic. The book’s other figure also played a vital role in the development of the Yankee dynasty. Huggins proved a successful judge of baseball talent. His most important attribute was an ability to take a group of players, many with big personalities and egos, and mold them into a winning team. Under previous manager Bill Donovan, the Yankees finished fifth, fourth and sixth in the three years prior to Huggins taking over in 1918. After firing Donovan, Ruppert hired Huggins and declared he would spare no expense in making the Yankees a winner. In the first three years the team finished in fourth, third and third. Pressure came from inside the Yankee organization from co-owner Colonel Tillinghast L’Hommedieu Huston and outside the organization from the New York sports press to fire Huggins, but Ruppert refused. Years later, Ruppert said hiring Huggins was the most important move toward building the Yankees.Yet, if not combined into a book with Ruppert, Huggins might not have warranted a biography at all. His contemporary, John McGraw was a stronger player and more significant manager than Huggins and has had a good biography written about him. Like some other managers who have biographies about them, think Leo Durocher and most recently Billy Martin, Huggins was a decent player, but unlike these men he lacked a fiery personality and had little interests outside of baseball. The book moves along with chapters devoted to single baseball seasons in which Ruppert and Huggins were involved with the Yankees. Most of these seasons are covered in significant detail. Readers receive a strong sense of the activities and attitudes of the players on the field, in the clubhouse, and of management in the team offices. Many of the Yankee players in the early dynasty led wild and wholly off-the-field lives during the season, and were reportedly celebrities around town. The connection between Prohibition and the nightclub culture, with the emerging celebrity culture and the baseball players, would have been a very interesting area to explore in greater detail than provided here. We learn about players like Carl Mays, Joe Bush, Babe Ruth and some other players who argued and defied their manager at times. But I wanted to know more about them and how their behavior and attitudes fit within the general behavior of baseball players at the time. What was the culture of baseball players among the figures from “the Deadball Era?” Indeed, we understand that Ruppert, Huggins and Barrow all sought to hire players who either did not have the personality or interest to pursue a bon vivant nightlife. The three agreed to suspend some players who enjoyed too many nights on the town because they believed that it hurt their performance on the field. Those players who enjoyed the nightlife too often, and combined that with a defiance of authority, discovered that the Yankee leadership would trade them away to become the headache of another team. The background information on Ruppert appears throughout the The Colonel and the Hug, which is one of the difficulties with the work. Many historians and others have stated that Ruppert demonstrated significant business acumen and they use the Yankees as their justification. Steinberg and Spatz inform us in various chapters that Ruppert made some poor investments. Not until the final chapter, though, did the authors illuminate that the owner had been heavily leveraged with debt. Steinberg and Spatz also tell us about Ruppert’s slow reaction to incorporating night games, radio broadcasts of games and Ladies Day promotions. More damaging to his reputation as a businessman, Ruppert maintained the old model for brewery sales after the repeal of Prohibition. He not only failed to see the market as it changed, he openly resisted the changes. The brand failed to keep up with the marketing, tastes and demographics that would shape the beer business over the next fifty years. The authors did a fantastic job depicting the environment of New York City and the eventual confrontation between the New York Giants, who dominated the city during the first two decades of the 20th century, and the Yankees who would later eclipse them on and off the field. Their descriptions of the contrasting organizational structures and the style of play between the two teams is very strong. Yet, these two authors discuss this change in greater detail in their other book, 1921, positively reviewed in the Nine and slightly less so in the Journal of Sports History. Intriguingly, the Giants remained a strong team on the field throughout the 1920s and into the 1930s, but started losing fans during this era, raising an interesting question about the business operation of the team owned by Charles Stoneham. It also offers the chance to look at whether New York City had the fan base to support three baseball teams. The book also contains strong sections on the relationship between Ruppert and Boston Red Sox’s owner Harry Frazee. The pair became key players in the diminishing of the dictatorial powers of American League President Ban Johnson. Along with his then partner Huston, Ruppert opposed decisions regarding assignment of players and suspensions to players during 1919. While the media supported Johnson’s position and his management of the league, the Colonels had tired of his autocratic ways and animosities influencing the league. The Yankees waged battles against Johnson’s decisions in the courts and won a decision based on the property rights of owners. Frazee and Charles Comiskey of the White Sox also opposed Johnson, with Frazee advocating that “I’m one of the eight employers of Ban Johnson.” The “Loyal Five,” the other American League owners who supported Johnson, decided after a contentious league meeting in February to establish a “Board of Review” for fines of $100 or more, taking away a major portion of Johnson’s power. The stories related to Ban Johnson offered some information about other owners of the era. Providing more information and insight into these men would have provided a greater opportunity to compare and contrast Ruppert with his contemporaries. Among other things, this information might have supported the authors’ argument that other owners spent a lot of money like the Yankees in pursuit of championships, but only the Yankees’ attained a high level of success. The insight regarding other owners would have enabled readers to learn about the types of men who held these position and the culture of Big League Baseball owners. Brett L. Abrams writes about popular culture, entertainment and sports. His books include Hollywood Bohemians, Capital Sporting Grounds,and The Bullets, The Wizards and Washington, D.C. Basketball. He is an electronic records archivist. He is currently working on a book about fans of six NFL teams. This book seems to marry the relationship between baseball as a sport and baseball as a business. The importance of hiring talent and expecting excellence seems to be a transformative theme in this book. The concept of talent equaling wins and wins equaling profit seems to be highlighted as the economic foundations of the modern sports era. What I am wondering is whether the concept of Murder’s Row, was the result of Ruppert’s and Huggins’ shrewdness of talent acquisition in an era focusing on profits over winning or was it a unique point in baseball to have one of the most notable procurements of talent on a single team in sports history? Very good points. Murder’s Row emerged because of a focus on winning with who they thought were the “right” character types to have on their team. Ruppert wanted to win all games by lopsided scores or else he was always nervous. This amassing of talent was not really that unique: recall that the team won in 1927-28 and made the Series in 1926. But the Philadelphia A’s another incredible amassing of talent won three consecutive years beginning in 1929, winning the first two World Series before losing in 1931. Mack had little money and did not make much profit. The St. Louis Cardinals had a run in 1930-31 and the Detroit Tigers would enjoy a run from 1934-35. Very nice review of The Colonel and Hug. I myself did not know how bad the Yankees were before Reppert hired Miller. I found this very interesting because now the New York Yankees are depicted as the most storied franchise in sports. I believe after reading this, Reppert had a lot to do with making them such a respected franchise. He took a baseball team and made it into a business. As a baseball fanatic, I realize how much of a business this is today. Do you think that Ruppert is a pioneer for modern day baseball in the business aspect? Also, do you think that with athletes on the Yankees today like CC Sabathia or Alex Rodriguez, would he have traded them because of all the off-field turmoil that comes along with them or kept them? What made Ruppert so effective is that he rarely meddled in the personnel aspects, leaving the field things to Huggins, and the members of the team to Huggins and Ed Barrow, the GM. He would have them decide about Rodriguez and Sabathia. The owner did pioneer the bigger salaries for big effect, such as paying Ruth & Gehrig, but not as much as DiMaggio wanted. He came second or third to establishment of a minor league system, and very late to the broadcasting of games so he was behind the curve there. This review highlighted a lot of great moments in the overtaking of the New York Yankees by Jacob Ruppert and manager Miller Huggins. Although I have not read the book, I found this review particularly helpful in pinpointing out how Ruppert’s introduction to the team effected the transformation of the Major Leagues. This review also happened to capture my attention because my uncle pitched for the Yankees during the time frame of 1961-1966. It occurred to me that if Ruppert had not invested the money that he did into building Yankee Stadium my uncle, Roland Sheldon, may not have been as much of a success; the stadium proved to be an important monument to the sports millennium. Nonetheless, I also credit the ever-so-popular relationship between Ruppert and Huggins for giving baseball players a name; they ultimately converted a group of alter-egos into a winning fantasy. Anyhow, my question to you is: Had Ruppert listened to co-owner Colonel Tillinghast L’Hommedieu Huston and the New York sports press and fired Huggins, would the business surrounding the Yankees be as large as it is today? Was the hiring process for managers as strict as the hiring process for players during this time? Nice comments. I do believe that had they fired Huggins as the press suggested it would have hampered the development of the Yankee dynasty. Who knows if the next manager could have balanced the egos and found the talent with the type of temperament that the organization wanted to bring to their team.